I just bought a MacBook Pro and FileVault is off. My machine is operating perfectly and I was wondering if turning on FileVault causes macOS Mojave to run slower. Thank you for this wonderful security checklist! Ian: Any recent MacBook Pro won’t run noticeably slower with FileVault. Is Mackeeper a program you recommend? Diane: Absolutely NOT. Just do a quick search on MacKeeper and you’ll find lots of people asking how to uninstall it or warning you about it. You don’t need any “cleaning” or maintenance software like that. macOS does everything you need on its own. Some of these apps are just a waste of money, others are a nuisance, and some are malware themselves. Stay away. See Do You Need a Mac Cleaning Program?. Thanks so much Gary I almost purchased it and decided I should check with the experts first… Mackeeper want you to think that you highly recommend them… so glad I didn’t buy it… again thanks so much !! Relating to MacKeeper – totally agree with Gary and also avoid all similar programs. This article is good for day to day operations, but is there an application or process to do a clean up or check for viruses that could be harmful. You see the ads for MacKeeper and I agree that is a scam. I run a disk utility, first aid everyday, but is that enough? Thank you. John: macOS already comes with checks for that at a system level. No need to run Disk Utility First Aid every day at all — should only be run if there is a problem. No need for a “maintenance app” either. Just follow my three rules and you shouldn’t ever run into a problem. Great advice, Gary. But the local independent authorized Mac repair guy says there is malware that hides in the fonts of Macs. He charges $80 to de-malware the laptop. Since he’s an authorized repair operation and has been in business for years, I want to trust him. But $80 bucks hurts when it comes out of the wallet. How accurate is this and if so, is there a program I could download to find and remove malware? Doug: Hides in fonts? I haven’t heard of anything like that and a search turns up nothing. Even if that were true, then what makes you think YOU have malware? What was your original reason for even consulting the guy? Sluggish performance on MacBook Pro and on a mini. Now the iMac seems to be dragging its feet. Doug: I wouldn’t jump to the conclusion that it is malware. Not at all. Can you take them to the Genius Bar for free help? Probably just a lack of free storage, aging hard drives, or a third-party app that is bogging things down. Doug: your repair guy is absolutely lying to you, or he’s simply ignorant. Given that he’s probably regularly charging people $80 to “de-malware” people’s Macs, I’d bet money that he’s just flat-out lying. 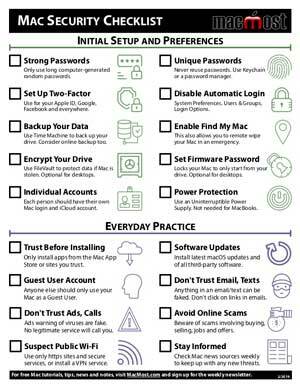 Leave a New Comment Related to "Mac Security Checklist"